A while ago I suggested filming how to make a hotbed for TV and as the time to make one has arrived I’ve set to and planted it today. A hotbed is a traditional way of using warmth generated by composting to force vegetable and flower crops into early production during a temperate winter. I enclosed one vegetable bed with bales of sugarcane and for the past three weeks have been doing my autumn pruning. Prunings have been chopped up and used to almost fill the bed to the top of the bales. These prunings – spent yams, bamboo leaves, ginger stems, sweet potato haulm, arrowroot, passionfruit, star jasmine and shrub prunings – aren’t as nitrogen-rich as manures or lawn clippings, so they shouldn’t decompose very quickly and generate excessive heat or release ammonia. Pruning complete, I tramped the prunings underfoot, settling the heap. Dolomite and blended, pelletised manure were spread over the heap. Dolomite sweetens the compost, counteracting the humic acid produced by decomposition and the manure acts as a compost accelerator, nourishing the fungi and bacteria. I emptied my large compost heap (by my nursery area), sorting it into two piles – one of semi-decomposed matter and another of ready to use compost. I spread the semi-decomposed material over the hotbed, then I spread the ready to use compost over that to form a planting bed. I tramped this down underfoot and watered it thoroughly with seaweed. I got some ‘Kestrel’ and ‘Sapphire’ potatoes and at dawn I pressed them into the layer of compost, then spread two square bales of sugarcane over them, completely filling the space. Lastly I watered the lot throughly with seaweed again and covered the bed with 50% shade cloth to conserve moisture. 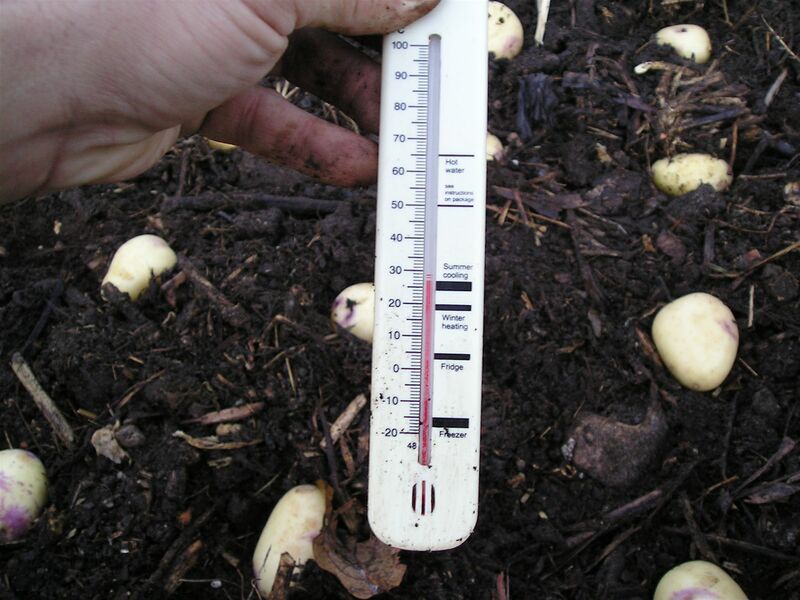 At 6.30am this morning the ambient temperature was 10˚C and 15cm down the compost was 25˚C. Ideally a hot bed should be 21˚C, and in the depths of an English winter this is achieved by using a mixture of horse manure and autumn leaves. This combination releases more heat as it decomposes. I’ll have to see how the temperature regulates itself and possibly – by removing the shadecloth – I can moderate it. The hotbed will create some theatre for when we’re open for the Open Garden Scheme in August – we’ll get a couple of cubic metres of compost and, hopefully, a main crop of potatoes. 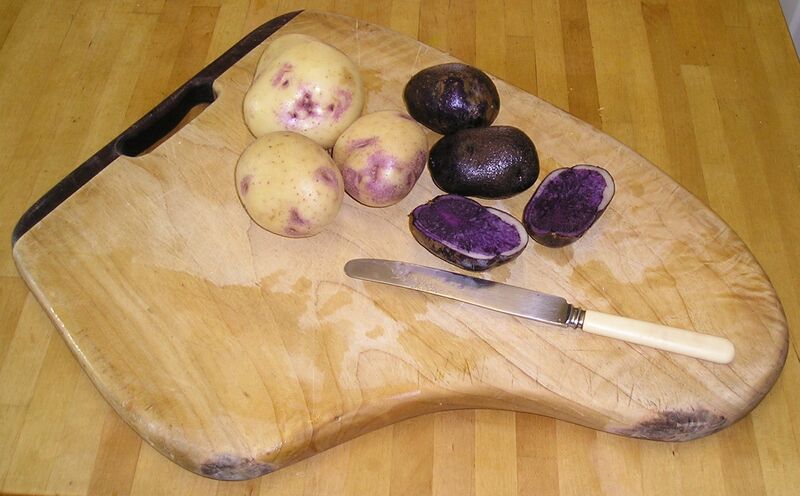 The potato cultivar ‘Sapphire’ is also known as ‘Royal Blue’ and ‘Salad Blue’. There’s a BBC web reference to ‘Salad Blue’ where they say this “…was first grown in Scotland in the early 20th century. Both skin and flesh are an intense indigo, and much of the colour is retained after cooking. The variety doesn’t boil well, but is good for frying and mashing”. According to ‘The European Cultivated Potato Database’ (see: http://www.europotato.org) ‘Kestrel’ was raised from seed hybridised by J.Dunnett, Clevnagreen, Freswick, Caithness.